July 8, 2013. Days of heavy rainfall in Western North Carolina are causing flooding and landslides in several mountain counties, damaging roads and impacting travel. Today, Gov. Pat McCrory, state legislators, N.C. Department of Transportation engineers and local law enforcement toured some of the hardest hit areas in Madison County. They saw the storms’ impacts firsthand and talked with residents about their commitment to rebuild damaged roadways as quickly as possible. NCDOT crews are currently assessing the damage and determining the most efficient ways to make repairs. 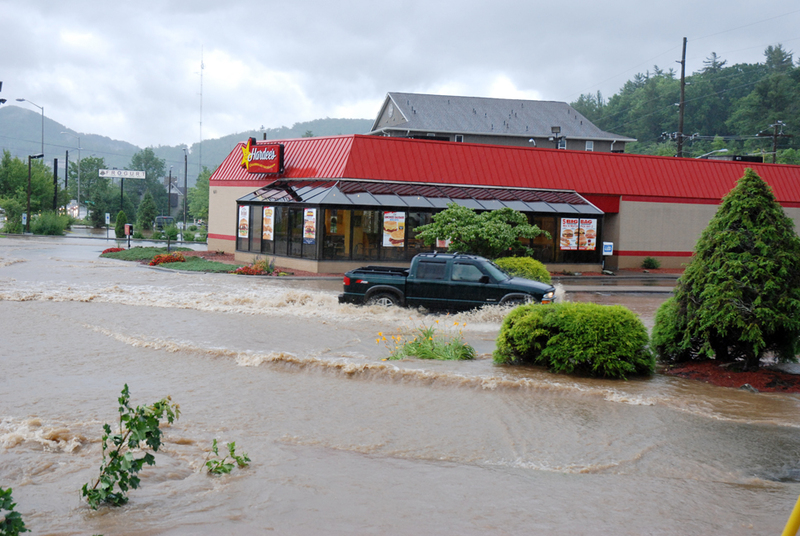 In many areas, flood waters remain too high to discern the full extent of the storms’ impacts. Once the water recedes, inspectors will examine roads, pipes and bridges that are now underwater and decide if repairs are needed. Gunter Town and Chapel Hill roads near the Laurel community in Pisgah National Forest suffered some of the most significant damage. Heavy rains washed away the hillside above some roads and the hillside below some roads, triggering mudslides that blocked lower roads. NCDOT crews have cleared debris from those blocked roads. The Marshall and Hot Springs areas have seen flooding, but currently, no bridges sustained damage. However, crews will evaluate all bridges once the high water recedes. A mudslide on Vance Gap Road has blocked off the area near the Governor’s Western Mansion. NCDOT is currently evaluating the situation, as well as other areas still dealing with flooding. Crews are replacing a 48-inch pipe that crosses under N.C. 113 west of Sparta after heavy rains washed it out Thursday. Repairs will continue through the weekend. NCDOT hopes to have the road open by Monday morning, weather permitting. The Yadkin River overflowed and washed out approximately 200 feet of the shoulder of N.C. 268 between two ends of Laytown Road, which loop back onto the highway northeast of Lenoir. Local traffic can use Laytown Road to get around the area, while tractor trailers must take Grandin Road to N.C. 18. Storms caused the shoulder of Waterfalls Road in Patterson near Lenoir to fail. The road is located parallel to U.S. 321. This is a wooded secondary road with steep slopes along which a section about 120 feet wide and 200 feet deep collapsed. Traffic is currently moving through the area; however, the shoulder remains blocked off from traffic. The hillside above Dark Ridge Road failed, bringing debris down onto the roadway. It is a through road, so residents can still access their homes. Crews are working to open the road later today. Heavy rain caused a landslide below Silverstein Road, forcing one lane of the road to close. This is also a through road, meaning residents can still access their homes. The road is down to one lane at this time. Estimates are it will take approximately two weeks to repair this slide area. A bridge on Dicks Creek Road suffered minor damage, and parts of the road were washed out in a few places, but traffic can still travel along the road and across the bridge. Motorists are advised to proceed with caution in areas with standing water. NCDOT urges drivers in the area to watch this video for tips on traveling safely during severe weather. For real-time travel information at any time, call 511, visit our travel webpage or follow NCDOT on Twitter. To see images of the storm damage, go to the NCDOT Facebook page. To view a map of the areas experiencing storm damage, visit this Google map.